When I first saw Flying Dog’s Dead Rise at the bottle shop, I knew I had to try it. A beer brewed with McCormick’s Old Bay seasoning? It sounded odd, but intriguing. 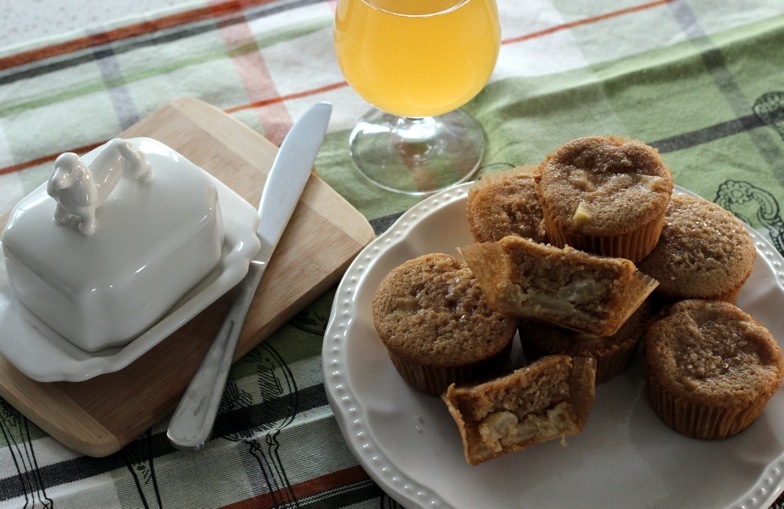 To my surprise, it was incredibly well-balanced: light and refreshing with some lemon notes and just enough celery salt to remind you there’s Old Bay in the brew. But the first thing that came to mind after trying a sip? 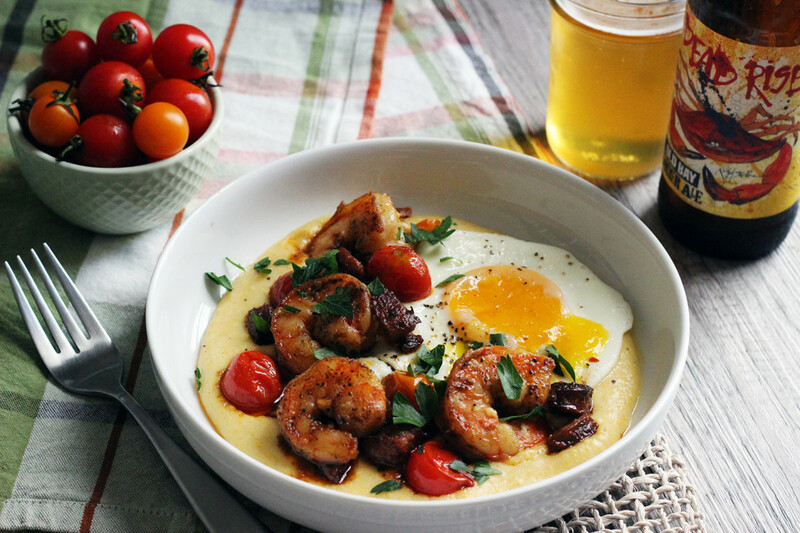 An intense craving for shrimp and grits. 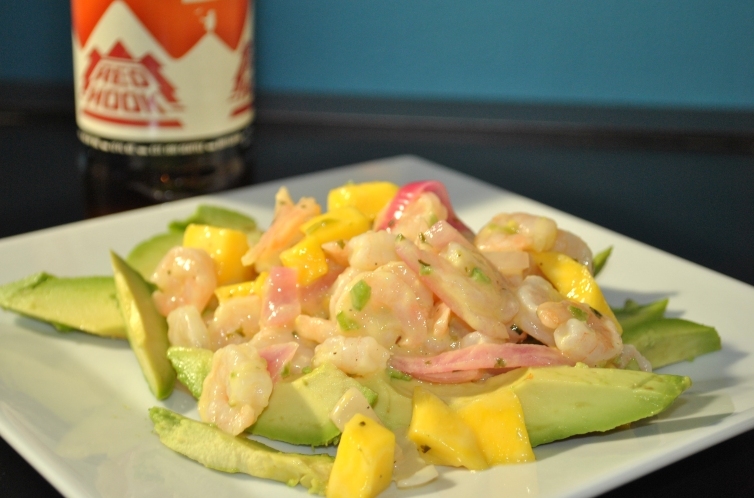 Old Bay is the quintessential seafood seasoning and goes exceptionally well with shrimp. The celery salt and spices are also slightly reminiscent of bloody marys and, well.. all of that culminated in thoughts of brunch. That’s where this dish comes in. 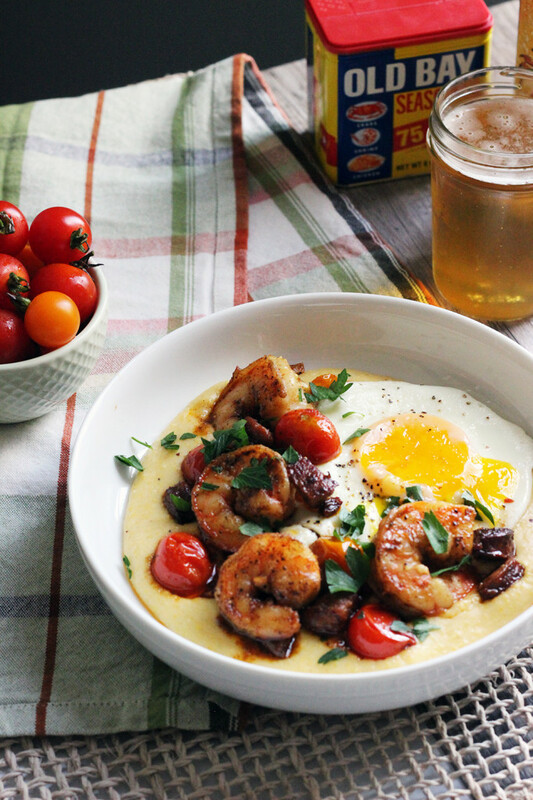 It starts with shrimp that’s been lightly coated in Old Bay and pan-fried with andouille sausage, continues with a pan sauce made with a Summer style ale, finds balance with the sweet acidity of blistered cherry tomatoes, and ends with creamy cheddar grits. Needless to say, it definitely satisfied that brunch craving. 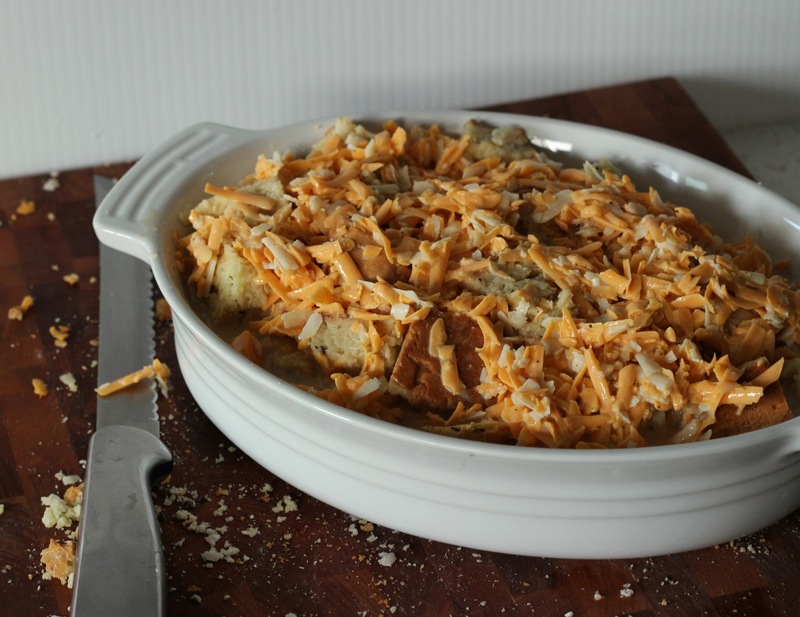 Serve with Flying Dog’s Dead Rise Ale, or another Summer Ale. No more Summer Seasonals? 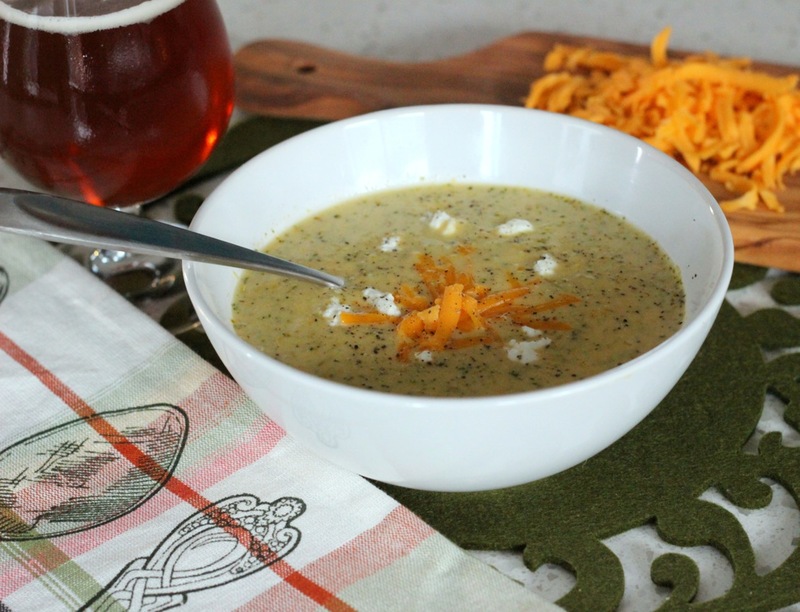 Serve with a craft lager, such as an IPL. Or pour yourself a Bloody Mary. Bring water and stock to a simmer in a medium pot over medium-high heat. Add grits in a stream while whisking continuously. Continue to whisk for the first 5 minutes over the higher heat. After the full 5 minutes have elapsed, reduce heat to low. Add a large pinch of salt and season with freshly ground black pepper. Whisk often to prevent clumps from forming. Grits are ready when thick and no longer grainy, about 20 to 25 minutes. Stir in butter and cheese. Taste; season with additional salt and pepper, if needed. Place a large, heavy skillet over medium heat. Add andouille sausage; sauté until fat begins to render and sausage browns, about 4 minutes. Add garlic, 1 tablespoon butter, and tomatoes; season with a pinch of salt. Let sit for 1 to 2 minutes; stir once; let sit over heat an additional 1 to 2 minutes, until tomatoes begin to blister. Reduce heat to medium; add shrimp and Old Bay. Cook 1 to 2 minutes, turning shrimp once. Add beer and stock. Simmer until shrimp is barely cooked through, about 2 minutes more depending on the size of the shrimp. Remove skillet from heat; set aside. Divide grits amongst bowls. Top with shrimp, andouille, tomato, and sauce mixture. Garnish with freshly chopped parsley. Add a fried egg, if desired.